There's a new generation of USB connector in the works and the new version is set to be smaller and - praise be - reversible. 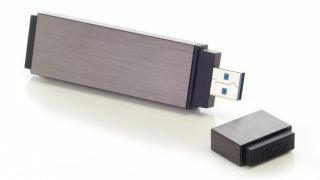 The new-look USB connector is expected to be finished by mid-2014, at which point manufacturers will start incorporating it into their products. Built on existing USB 3.1 technology, the redesigned Type C connector should still offer the 10Gbps speeds offered by existing 3.1 hardware. The smaller size means that phone chargers, laptops, PCs and hard drives can all slim down. The USB 3.0 Promoter Group, which is developing the standard, says it will be similar in size to the microUSB jack that many smartphones use. The flip-reversibility of the new hardware will also mean that we can all stop taking years off our lives due to the frustration of trying to plug the jack in, turning it over and trying again, before realising we had it right the first time. However, it will mean a tedious few years where half your tech will only work with half your accessories as the switch-over from the current size USB to the new-size USB takes place, something that Apple users are experiencing with the shift to Lightning connectors that the iPhone 5 brought with it. Still - worth it in the long run.